Just released a limited edition of the Low Profile Nicodemus rings. Very low set and short towered. I very rarely have these available. Once every 10 years. There are only 6. They are set very low without cemetery flowers. Their setting is a super lightweight hypoallergenic stainless steel setting. A symbolic representation of low magic and the forever seeing Watcher's eye. An old world meeting between the low lands and dusk; standing upright walking against the Northwind switch grass undetected. The watcher is tall but the grass is taller. A New world meeting of a modern metal setting, frozen in a clear frameless dome. He lays on a bed of crushed obsidian. More detail on the website. Very limited. 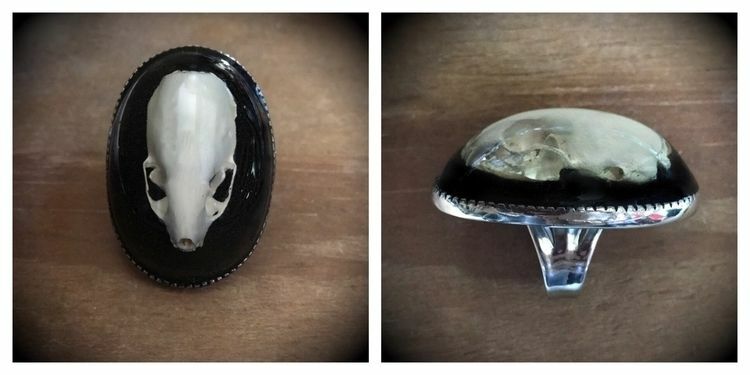 >>> Also as usual I would like to stress that these skulls are ethically sourced and cruelty free. We get our skulls from owl pellets. We used to also use finds too with pellets many years ago but for the past few years have only used pellets. This is a process of getting skulls of small mammals from the pellet that the owl naturally discards. No animal will ever be harmed for jewelry making, animal medicine, or human vanities. Never have and never will.